The Illinois Railway Museum needs your help to save a living piece of Illinois railroad history! Morristown & Erie Railway 18, a fully-operational Alco Century 424, has a deep Illinois connection, having been built in September, 1964 for the Toledo, Peoria & Western as its number 800. 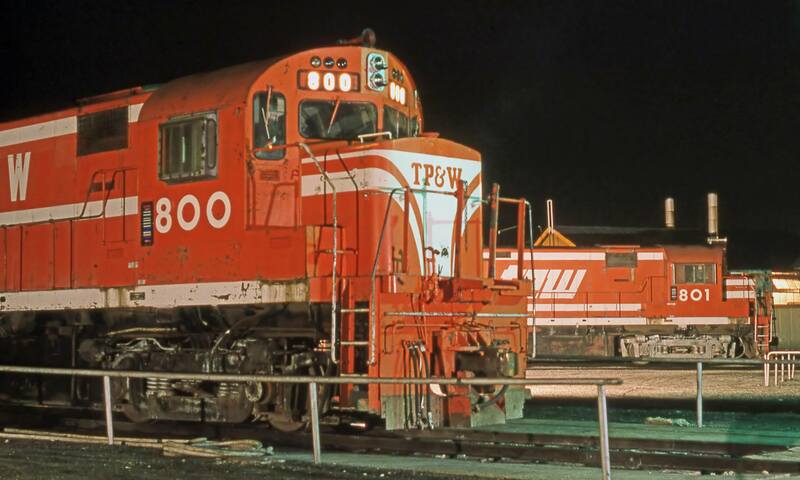 Both the 800 and her sister, 801, served the “Tip-Up” admirably hauling time freights across the Illinois prairie until they were sold to the M&E in 1983 and moved to New Jersey for continued service. IRM has purchased this locomotive and moved it to Union – but the work isn’t done! Purchase and transportation of the locomotive has cost $57,500 – much of it borrowed and needing to be paid back – while another $6,000 is needed to pay for “track space”, which provides for the construction of new track at IRM for her to sit on. Allowing for incidental costs, a total of $65,000 must be raised to insure the 800’s future at IRM! Preserving the 800 at IRM not only reunites it with a locomotive it ran with in service on the TP&W (RS11 400), it is also be the very first Alco Century-series locomotive in the Museum’s extensive diesel locomotive collection! Between Alco and its Canadian subsidiary Montreal Locomotive Works (MLW), there were 190 C424’s built between 1963 and 1967. The model number, 424, denotes a four-axle locomotive powered by an Alco 16-cylinder 251B engine generating 2,400 horsepower. Time is of the essence! Won’t you help us ensure the 800 has a permanent home in Illinois? Donations of $100 or more will receive a special commemorative “I helped save the 800!” T-shirt. Donations of $250 or more will receive the T-shirt AND a limited-edition coffee mug or glass featuring the TP&W 800. “Century 424 Club” ($424 or more): Donors at this level receive the commemorative T-shirt, the mug/glass AND a custom-made replica “800” number board, as she wore while on the TP&W. $800 for the 800: Donors at this level will receive time at the throttle of the 800, hauling a train on the Museum’s demonstration railroad at track speed! This in addition to all the other gifts provided at the other levels (T-shirt, glass/mug and replica number board). You can click on the donation links above to give at a specified level or a custom amount. If you reach a donor level over the course of several donations, you will automatically be upgraded to that donor level.